March 9, 2013 marks Day One of a people’s campaign to transform Vancouver’s noise and building bylaws — to better protect the health, safety, and quality of life of citizens living near demolition and construction sites. Vancouver’s regulations are substandard when it comes to balancing the interests of construction companies versus the interests of residents in communities. The Westbank/Peterson/Henriquez project to build a 22-story tower at 1401 Comox, on the former site of St John’s Church, is a test case that will bring in some of the region’s biggest developers and most prominent architects, the top industry organization (UDI), politicians and City staff. Legislation will have to be improved. Industry guidelines and company practices will have to change so that Vancouver can one day claim it is a world leader in best practices. Today, we are far from that spot. To achieve success, the involvement of many people in communities around the city will be essential. Stay tuned for more. See related material on CityHallWatch. SUMMARY: Just after Nov 3, 2009, the immediate two blocks around 1401 Comox in Vancouver’s West End received a letter in the mail announcing an application to rezone the site of the site of St John’s Church (which has a history over 100 years in the community) for a 22-storey tower with a 500% increase in the permitted floor space. In June 2012, the project was approved by City Council with minor cosmetic changes from the original application. Main partners are Westbank Projects Corp, Peterson Investment Group, and Henriquez Partners Architects to build a 22-story tower of apartments. On December 15, City Council voted to approve a similar proposal at 1215 Bidwell Street. It turns out that both are fast-tracked under the city’s STIR program to build rental housing, and that several more such towers are now being prepared but have not yet announced publicly. More rental housing in Vancouver is a good thing, but these STIR projects in the West End have high costs for Vancouver taxpayers, have serious cumulative impacts, violate the existing official community plans and guidelines, and will result in dramatic and irreversible changes to the community. And these changes are being made without full disclosure or public consultation with the affected community of over 45,000. This website was created by community members, for the community, to sort through the complexities and issues. We will revise and update it as time goes by. 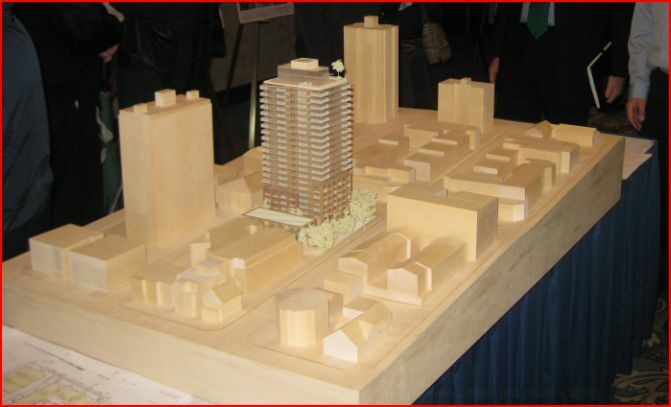 2010 will be a critical year in the history of the West End and Vancouver. We invite you to send us an e-mail any time with your impressions of the event, including information you found interesting, discoveries, concerns, ideas, and so on. We will compile them and report back on this website to help facilitate community dialogue. The only official event organized by the City where the public can voice its opinions in a public meeting will be at the final council meeting when elected City Councilors vote to make a final decision, likely in the spring of 2010. This is a very bad idea. West End doesn’t need to be turned into another Yaletown. I wonder who is going to get rich as this proposal doesn’t consider the neighbourhood and community at all. I don’t want to live jammed between high storey buildings and I don’t think West End needs another high storey rental building. This could be just the beginning of an new approach to the neighbourhood. I will be fine with a 5-6 storey building but not as high as 20 storey.